Raymond D. Mead, 97, of Catawissa passed away Sunday, Nov. 25, 2018, at Emmanuel Center for Nursing and Rehabilitation. He was born March 8, 1921, in Plainfield, New Jersey, a son of the late Joyclin and May (Then) Mead. He graduated from New Brunswick High School in New Jersey and attended Rutgers University. 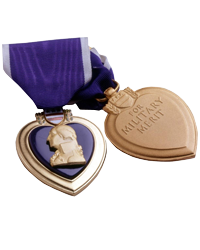 He served in the United States Navy during World War II, where he received the Philippine Liberation Medal with two stars, American Defense Service Bronze Star, American Area Campaign Medal, Asiatic-Pacific Area Silver Star, Midway and Coral Sea Bronze Stars, Good Conduct Medal and Purple Heart. Raymond was a member of Veterans of Foreign Wars and the American Legion in Neptune, N.J. He worked for New Jersey Bell, was a deputy for the Fish and Game Commission, and the New Jersey Marine Police. He also owned and operated the Mead Brothers Gun Repair with his brother Louis. Raymond enjoyed pheasant hunting. Raymond is survived by two children: Karen Rager and husband James of Catawissa, and Richard Mead and wife Cheryl of Kissimmee, Florida; seven grandchildren and 11 great-grandchildren. Raymond was preceded in death by his parents, as well as his wife, the former Irene Breece, who passed away Feb. 23, 2011, and brother, Louis Mead. At Raymond’s request, there will be no services. Family and friends may send online condolences to allenrhornefuneralhome.com. The Allen R. Horne Funeral Home and Cremation Services, 193 McIntyre Road, Catawissa, is handling arrangements.